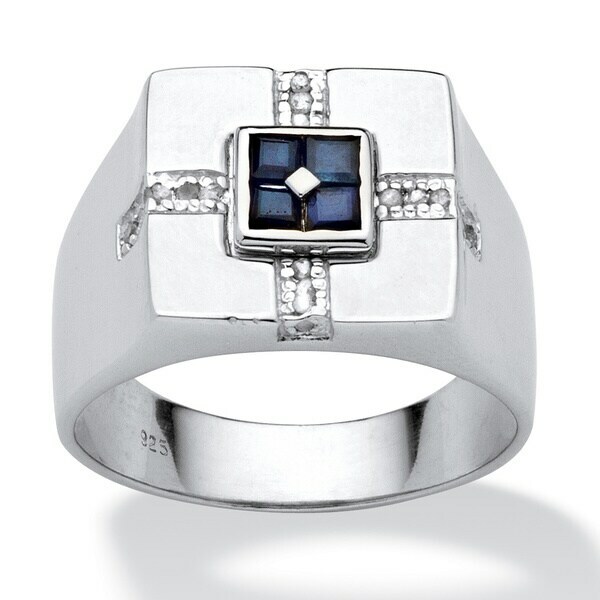 A square of four deep blue sapphires adorns the center of this bold men's ring, with four lines of twinkling white diamonds running to the compass points. This piece of jewelry is crafted of sterling silver with a highly polished finish. All weights and measurements are approximate and may vary slightly from the listed information. *T.W. (total weight) is approximate. 1/10 carat T.W. may be 0.08 to 0.12 carat. Treatment code E (sapphire) and N (diamond). See Treatment Guide for further information. See Treatment Guide for further information. Can't help admiring this ring on your finger. Beautiful men's ring. Unique design. I actually love this ring. I wanted my son's to have something special on their 18th birthday (twins) but reflective of each of their personalities. This was perfect for my son. I could tell the ring was quality by the picture but it literally took my breath away when I opened the box. This could not have been a better purchase. Fairly prompt delivery and my son has not taken it off his hand since unwrapping it. Thank you for allowing me to surprise my son with a ring that he can wear for many years. Color was off, cheap feel to the ring. This ring was light in weight, cheap feeling, and had no color to it, the stones were grey and foggy looking. The ring is stunning however it is hollow from the shank up which makes it fairly uncomfortable. This ring is very pretty, the problem is that I'm afraid of wearing it because of sharp edges inside . Thank you I am very pleased. HIGHLY DISAPPOINTING! I looks and feels like tin. I was so looking forward to wearing it but I was so disappointed when I received it. It somehow looks like a giveaway when you purchase a bag of candies.